I can't figure out what forum this belongs in...? heneyways, does anyone grow wheat? or any other grains for that matter? how much space do I need to grow it and all that jazz? I grow wheat now and then. Usually for a cover and green manure crop. Not interested in growing it for the grain. When garden crops are finished, I plant wheat on the space. It will later be tilled in for a green manure crop. It comes up quickly and grows fast. The seed is not too expensive. You can grow wheat on any square footage or acreage. If you have some winter wheat plant it in the fall (about the first of September here) and it will winter over and grow early. You really need a pretty big plot to get much grain. Then you have the problem of threshing it. If you want to grow it for the hay, it will make a lot of mulch. Yes, that matter of surviving in case the trucks quit rolling is a real concern. What we do is buy wheat and store it. We use wheat all the time for bread, cereal, and pancakes. We use about 200 pounds a year, so I always try to have a bit more than that on hand and rotate it. When we empty a sack we buy another. Wheat is a great storage item. If you put it in sealed containers with an oxypacket, it will last for many years. Here in our dry climate, we just store it in a wooden bin in the basement. No sealed container. Although we do have some canned in #10 cans for long term storage. The wheat is ground with a little electric mill into flour. We have a handcrank grinder too, but you would earn your bread grinding wheat with that. It would beat starving though. I bake bread every Thursday. Last edited by jal_ut on Sun Jul 25, 2010 2:57 am, edited 1 time in total. On the subject of threshing: You can put the heads in a feed sack, tie the mouth shut then beat it up. step on it, hang it up and whack it with a ball bat, whatever. It will thresh the wheat. Now you need a fan on a pedestal. Plug the fan in and place a large pan on the ground below it. What you will do is drop the threshed grain in front of the fan. The wheat will drop into the pan because it is heavy, the chaff will be blown away by the fan. This is also a great way to thresh dry beans. Last edited by jal_ut on Sun Jul 25, 2010 4:24 am, edited 1 time in total. I am harvesting all the wild foods that I can, to process for later use. And trying to keep the garden planted, as soon as, something comes out, something is ready to go right into the space. Wheat is a cool season crop. You can get up to 20 pounds per 100 square feet. That would be 10x10 area. 140 days to harvest. Full sun. Ph should be 7.0-8.5. You want poor soil, and no nitrogen added. Nitrogen causes the wheat to fail. It does like bone meal and rock phosphate. You need 6-10 ounces of wheat seed to plant 100 square feet. Rows should be 6" spacing, and within row 1" spacing. Depth to sow is 1". When your wheat kernels are doughy and not milky, you cut them, and tie them into bundles to dry longer these are called sheaves, and you stack several and cover the top. Let them dry like this a week to 10 days. Then get your pillowcase and do as suggested in other link. Or get a trash can (clean) and beat the wheat heads against the sides of the trash can. You then use wind or fan to remove the debris. The oils in wheat will go rancid so store in a cool dry place. I hope that helps, I haven't grown grain, yet, I am still reading and learning. Concern of the future, and the economic situation, has me "preparing for the worst and hoping for the best". I don't think that I am going overboard, or panicking, but just working hard at learning and storing what is available to me. And learning to grow new things. You want poor soil, and no nitrogen added. Nitrogen causes the wheat to fail. On the contrary. Do the research. Wheat, like corn, is a heavy feeder and responds well to nitrogen fertilizer. The same goes for all of the grain crops. The oils in wheat will go rancid so store in a cool dry place. Funny thing about the oils in wheat, they won't go rancid until the wheat is ground. 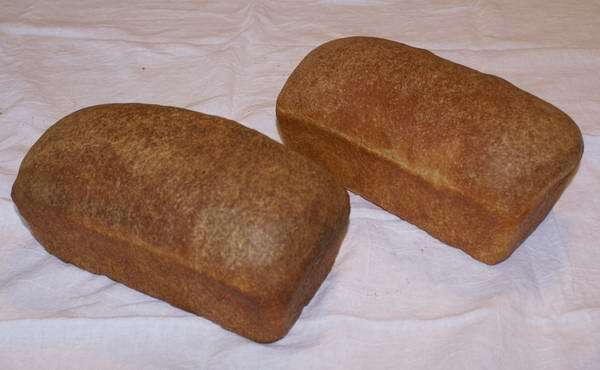 Fresh ground whole wheat is best kept in the refrigerator. When I plant wheat on acres, I use a drill and plant 80 pounds per acre and also add 80 lbs. of ammonium nitrate (nitrogen fertilizer) per acre. The nitrogen is the difference between 30 and 50 bushels per acre. The seed will be planted 2 inches deep and rows 8 inches apart. When I plant wheat on a small scale I either broadcast the seed by hand then rake it in with a hand rake, or if its a little larger spot I will broadcast the seed with a whirlybird seeder then pull a harrows across it to cover the seed. The seed won't be very deep. Water by sprinkling well and it will germinate very quickly. The seed is at random spacing. It can be quite close together. Wow, the difference in someone who has done it, and someone who wrote a book on it! Hey, I only read the book and repeated what it said. Go with Jal's post for sure. Kind of reminds me of folks saying that sweet potatoes like poor soil, on the contrary, they won't die in poor soil, but to get a better crop you need to provide what they need in the soil! I'm trying to do all the research and planning now... my DH thinks I am INSANE. seriously. I feel like I'm being practical. why let my family starve to death if I can have things planned to feed them? ya know? oh well. Some words for your to try in "Search the Forum"
If you have access to the beach - sea shells and sea weed are definitely great sources. Watch out for the salt content though. Try them in the search too, they've been discussed before. That is right, egg shells... I have those too. I do save them. I grew up on a farm in southern Illinois we use to plant wheat in the winter. You plant wheat like grass seed there is a spinning blade under the seeder that throws the seed in all directions. Plants are very close together just like the grass in your yard. You harvest wheat about mid May to 1st week of June then you plant soy beans where the wheat was. You don't usually plant corn after wheat because corn is best planted in early spring. Most farmers like to have corn planted no later than 2nd week of May if weather permits. The earlier corn is planted the better the harvest will be. Corn likes cool weather if the ears mature in the hottest part of the summer the harvest will be smaller. If you grow your own you will have to thresh it. The easy way to thresh it your self is cut it down and make bundles that are a large hand full. Stick a bundle inside of a burlap bag and beat it against a tree or the barn for about 60 seconds. Pull out the bundle it will be straw the grain is in the bottom of the bag. Wait for a windy day pour a bucket of wheat from about 5 ft up very slow to a tarp on the ground the wind will blow away the chat leaving only the grain. You can grind your own whole wheat flour with your kitchen food processor or blender. Pour in a cup of grain and turn it on.